Touching the towel can serve as a silent meditation to be present. For me, it’s about connection. These quotations are from interviews with Caryn Cushman and Carol Chambers about how using their Whimsy & Tea towel affects their everyday lives. As you know from reading my Whimsy-grams, I believe beauty makes a difference in our everyday lives. But what is the difference it makes? How does it affect daily life? 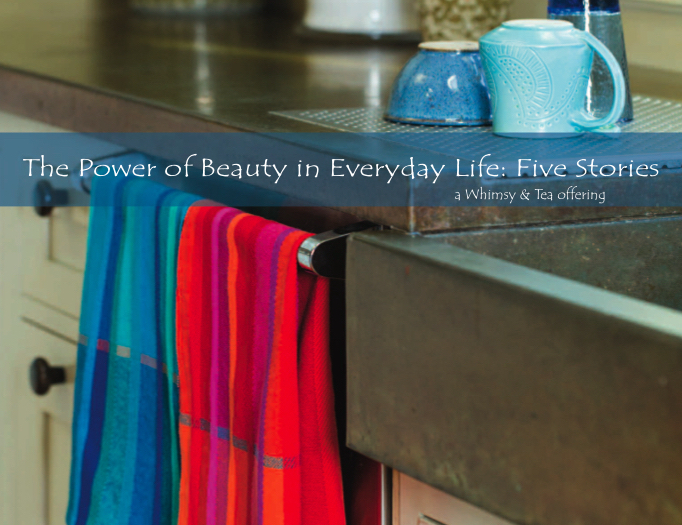 I interviewed five women who own a Whimsy & Tea towel (or two or three or four) or a Whimsy & Tea napkin to help me explore these questions. I so enjoyed talking with these women and learning from their perspectives. Our conversations affirmed the importance of everyday beauty and fleshed out the nature of the difference it makes in our lives. I’ve compiled these interviews into an ebook – “The Power of Beauty in Everyday Life: Five Stories” – and am excited to share these women’s voices with you. They’ve deepened my understanding of what I offer and I hope they inspire you to reflect on your own experiences of beauty. At the end of each interview, I offer ideas and suggestions for small things you can do to incorporate more beauty into your everyday life. Things like lighting a candle at breakfast on a rainy day or taking three deep breaths when you see a particular object in your home. Integrating beauty into daily life doesn’t have to be hard or complicated. Little moments add up and enhance the quality of life. Make yourself a cup of your favorite beverage, settle into a comfortable spot and savor these reflections about the difference beauty can make in everyday life. Experiment with the ideas and suggestions and see what happens when you implement them. I am honored that Carol, Cindy, Caryn, Deirdre and Molly let me interview them and am excited to share our conversations with you. May these conversations deepen your understanding of the difference beauty makes in everyday life, as they have for me. P.S. If you know someone who would also appreciate reading this ebook, I invite you to share it. I recall, however, a quilt my grandmother made for me as a child. It wasn’t made with a complex design, but I loved its muted colour and comfortable texture. It became, for me, the perfect weight under which to sleep. Each night, I’d think about her plucking her birds–she kept chickens and geese for food–on her front steps, as I’d seen her do many times during summer visits. I’d imagine her lovingly collecting the down and saving it for my quilt. She had many grandchildren, but I knew she’d chosen the oh-so-soft fabric for me alone because I had sensory issues. My grandmother passed many years ago, and my mother eventually discarded my much-loved quilt because it was “threadbare” (although to me, it had simply gotten softer over the years). I can still, however, close my eyes and conjure up the wonderful sensations and memories it provided during my early childhood years. Doing so gives me a palpable feeling of peace. What a wonderful story, Connie. Thanks for sharing the sensory details and memories. It’s clear that although you no longer have the physical quilt, the quilt is very much with you.